I hope every one is having a fantastic week. I am sure enjoying the weather here in Central Indiana- a perfect 75 degrees! Friday looks like it may be the day I get the garden tilled, and then I’ll have a few gardening posts for you now and then in addition to this craftiness! Today I wanted to share with you something I’ve been referring to as my “super secret project” over on Facebook (are you a fan yet by the way? Click here to become one!) and I’m pretty excited to share this with you because I’m really looking forward to some feedback. I’ve been wanting to expand the Sunday Afternoon Housewife line a bit, and I figured a really fun way to go about it might be making my own molds to cast resin in. I really enjoy working with resin because it always keeps me guessing every single time I try a new project! 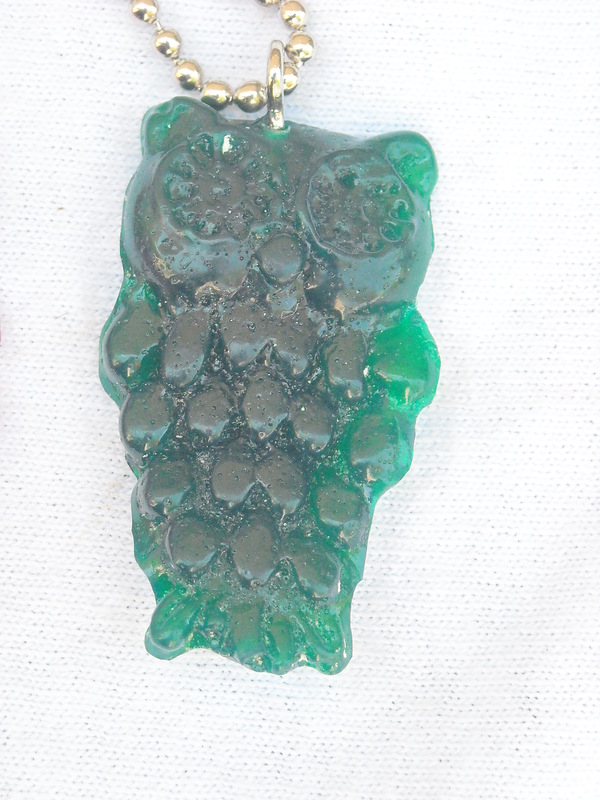 Anyway, I purchased some mold making materials and then went about casting my own mold and then casting resin inside that mold to create unique resin pendant. So, I’d love to know what you think about these. Are these something you like or think you would wear or possibly buy as a gift? Or, do you find them ugly and wonder what on earth I was thinking? 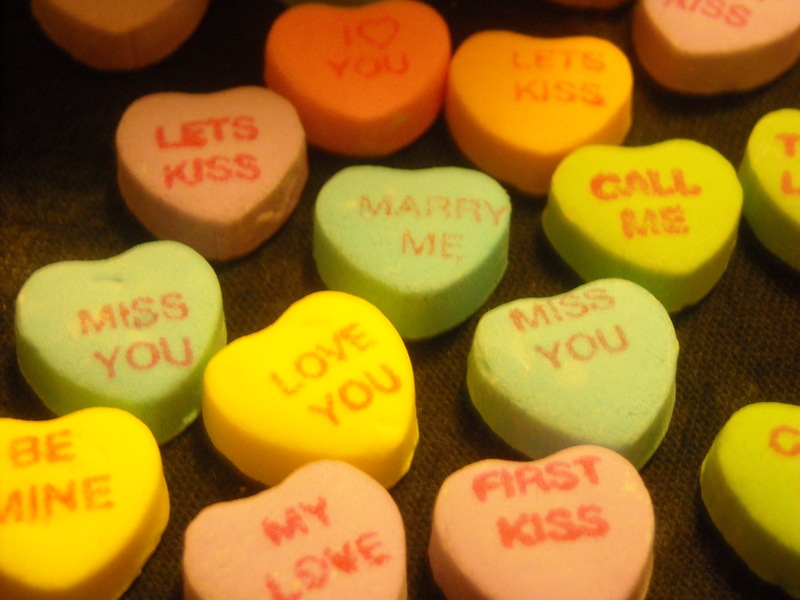 Honesty is the best policy around here, so please share your thoughts! Of course if you like these, I’ll make more in more colors and probably work on perfecting the process, and if you tell me you hate it, well, then I’m back to the drawing board! Comments, please! 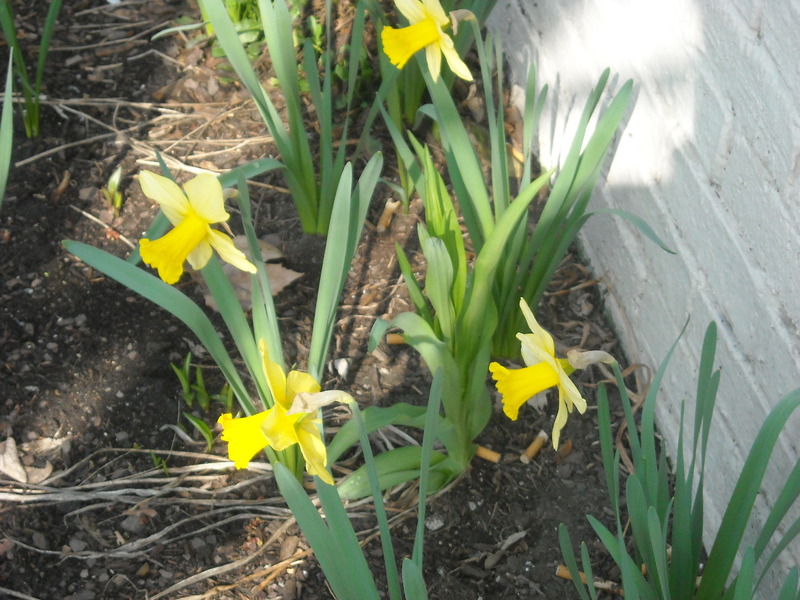 It’s a sunny and brisk spring morning at Housewife HQ, but the daffodils are in full bloom! To me, spring always means the arrival of new things, and not one to be left out, I’ve created a few new things myself this past week! 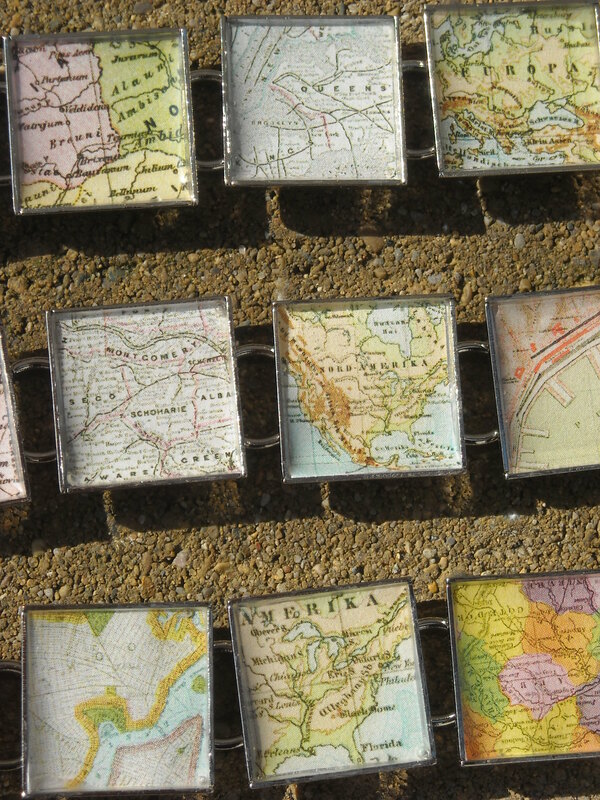 While the scrabble tile pendants are being made at an alarming rate to recover from the 10 days in Texas, I also can’t resist the call to create a little something different and new. 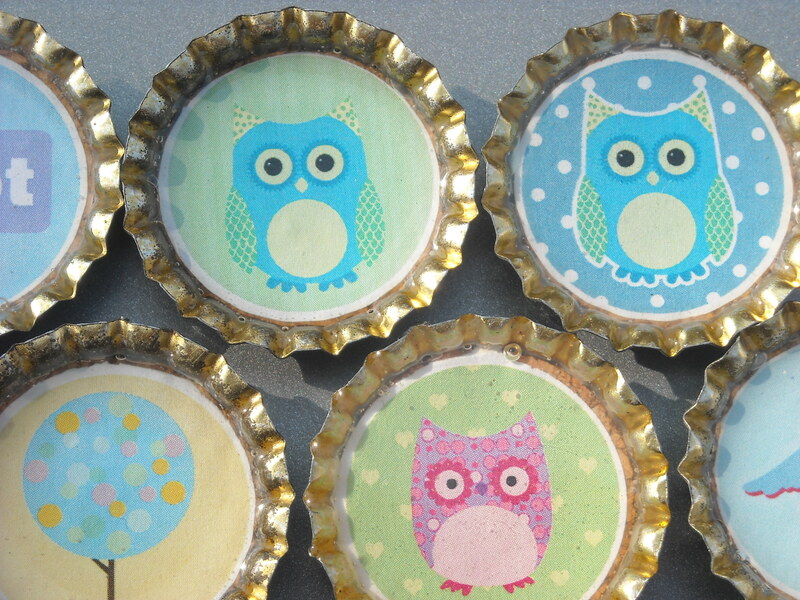 I’ve been making bottle cap magnets for a while now, but spring heralds the arrival of these new hoot owl designs! And what about the totally new? 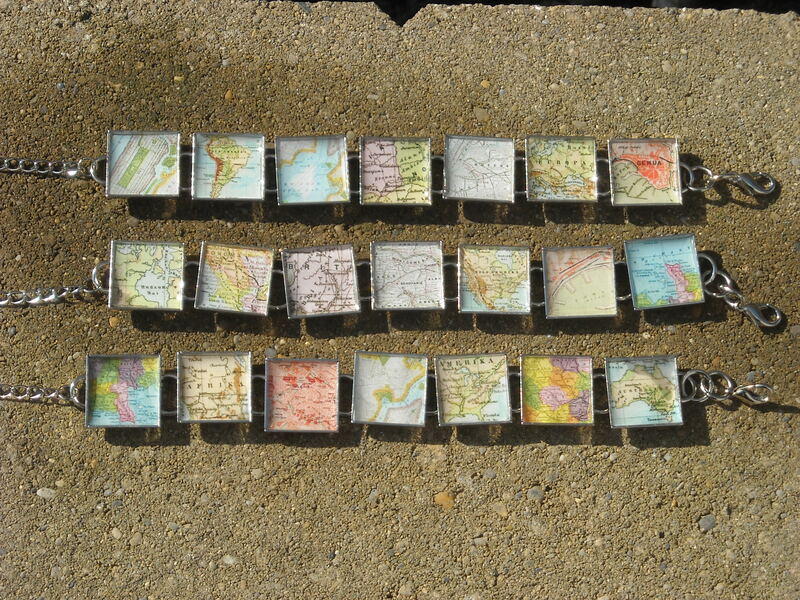 Well, I came across some bracelet blanks, and because of my recent travels, I was inspired to make these great new map bracelets! Each bracelet had 7 charms with a totally different picture, so each bracelet is totally different and unique! 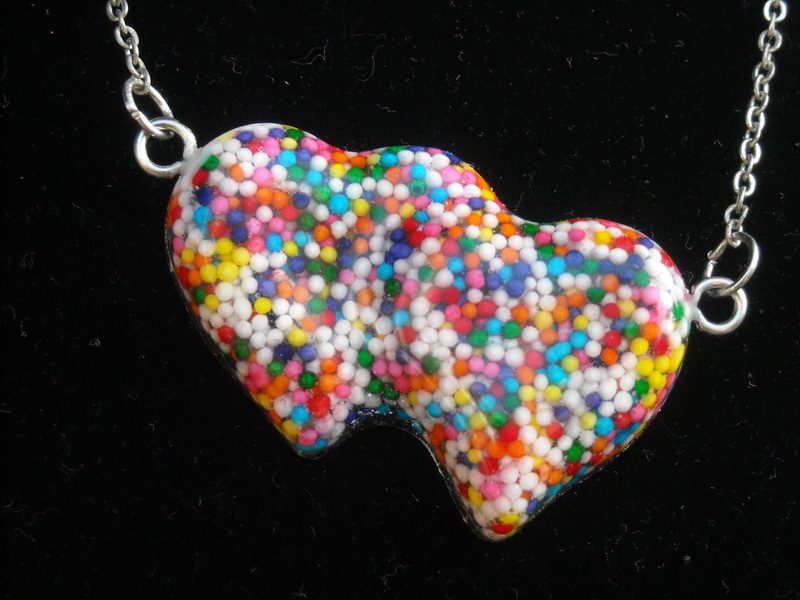 And, always a fan of finding new molds and seeing what I can stick in resin and create, I’ve got a new design of my popular candy sprinkle pendant. This double heart pendant has that fancy “broken chain” look! Who wouldn’t want to sport this on a lovely spring day? So, I know you want to be the first to have one of these sweet newbies, and guess where you can get it? This Saturday I’ll be down in lovely Bloomington, IN for the Bloomington Handmade Market. Hours for the show are 10 am- 4 pm, and there are lots of awesome vendors (43 to be exact!) so stop by and see us all! Today I was wrapping up working on some rings that I started the other week. I wanted to get them done and take them over to Midland Arts and Antiques before the weekend to fill out my case. Anyway, after I was working on my rings, I was doing a little Etsy search on rings to see what else was out there, and I came across some really cute rings! So, I thought today could be ring day. I figured I could share a few photos of my new rings and then, just for the hey of it, share a few of the other ring favorites I came across on my little internet search. 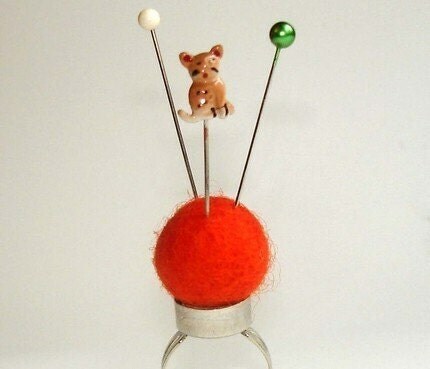 Of course this wool pincushion ring by junebugz is more functional maybe than actually every-day-wearable, but how cute is it? I could think of something to sew everyday if I had this cute ring! If you know me a little at owl, oops…I mean all, then you know I have a thing for cute little owls. 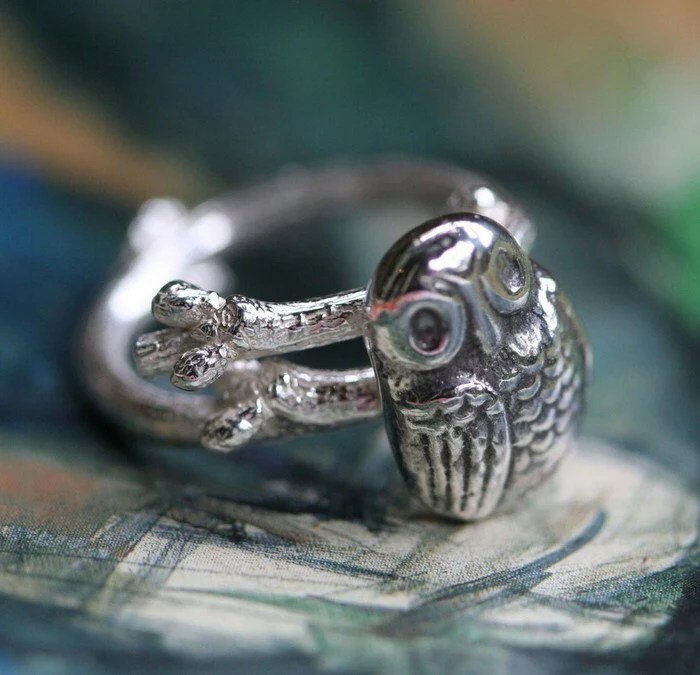 This gorgeous sterling silver owl ring by eRosasjewelry is certainly a wish list item for me with its $110 price tag, but it’s too amazing to leave off my list of fave rings! 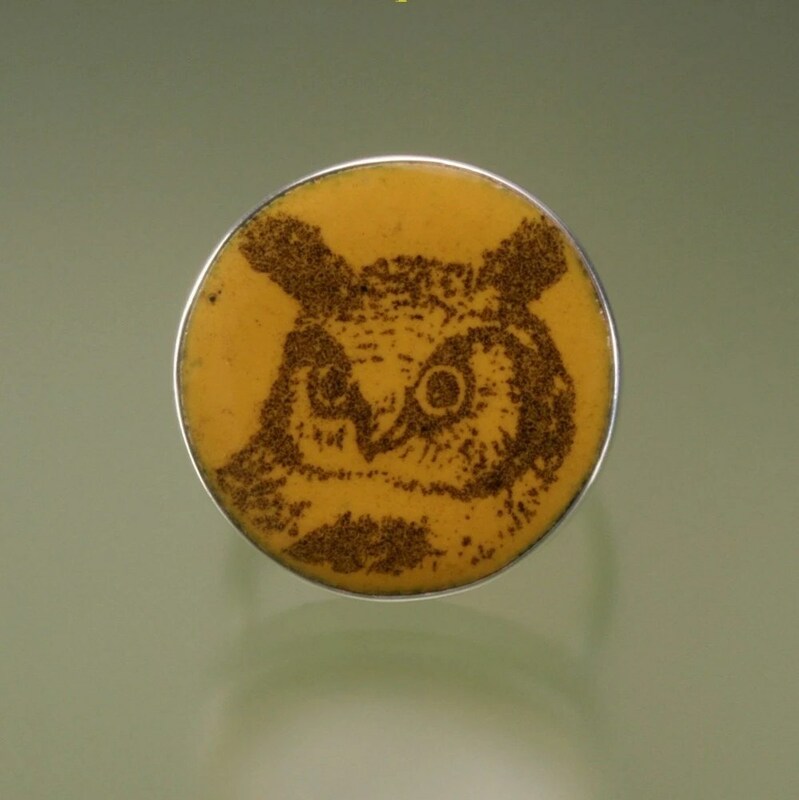 And, sticking with the owl theme for a minute, metallove has and adorable enamel owl ring on her Etsy a little closer to my price range at $42. I could see this as an every day wear type of ring for me. 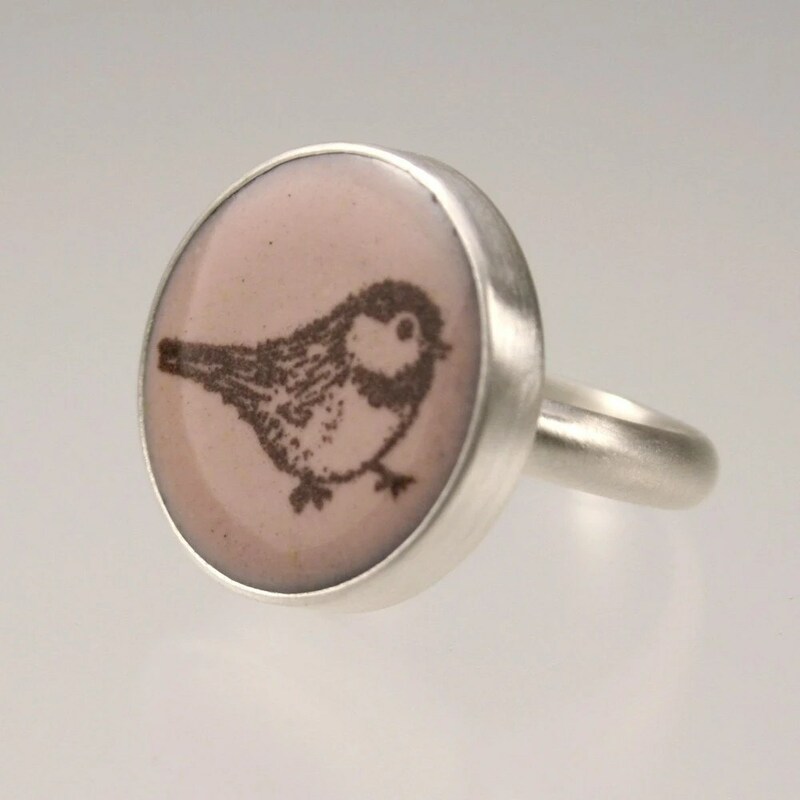 metallove also had this adorable chickadee ring which I really like and couldn’t resist including. 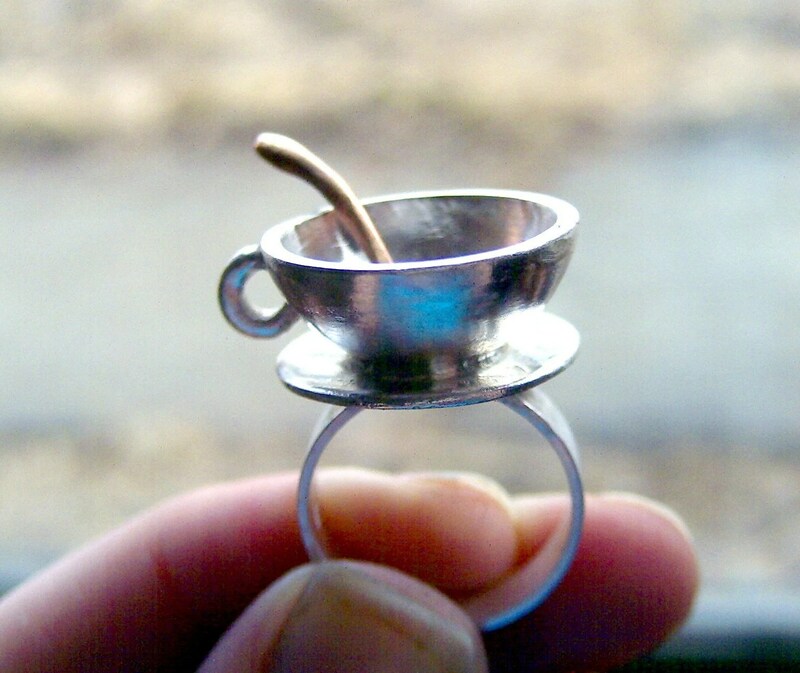 AnniePants has on her Etsy this petite tea cup ring. I saw a tea cup ring a long while back and I really loved it. This one is quite similar to the one I saw and I like it very much. It’s sterling silver and hand fabricated. How amazing! 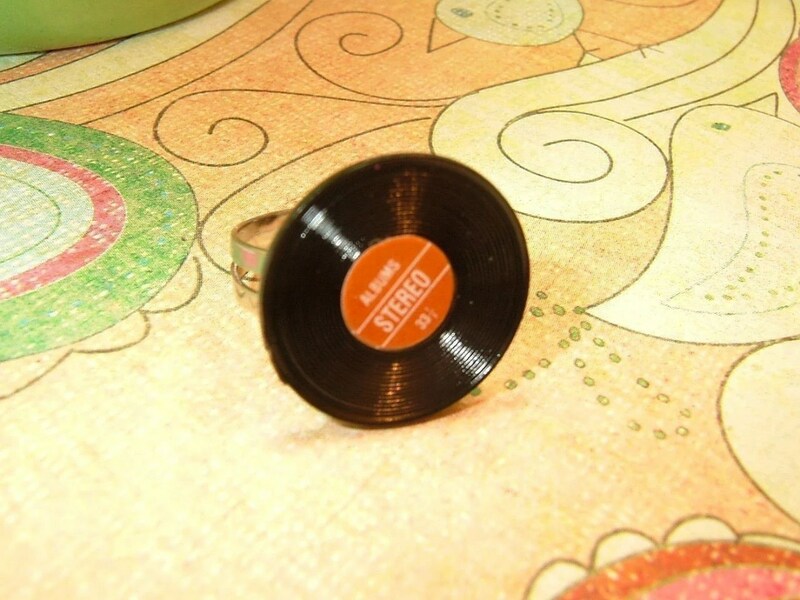 This record ring from Sypria is super fun. I could see myself wear this to a rock show, or on a casual evening out. She also has some really cute owl earrings, but alas this is a post about ring only! 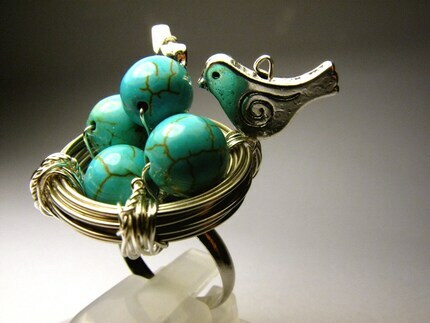 mrsdazo has another example of an obsession of my: bird nest rings. This one I like particularly well because of the blue color of the “eggs.” And, at only $18 this ring is affordable and adorable! I love it! Lastly, I will let you feast your eyes on some of my new rings. I’m going to get a few up on Etsy soon, but you can much more easily (if you’re in Indy anyway) get them this weekend at Midland Arts and Antiques on Michigan Road. 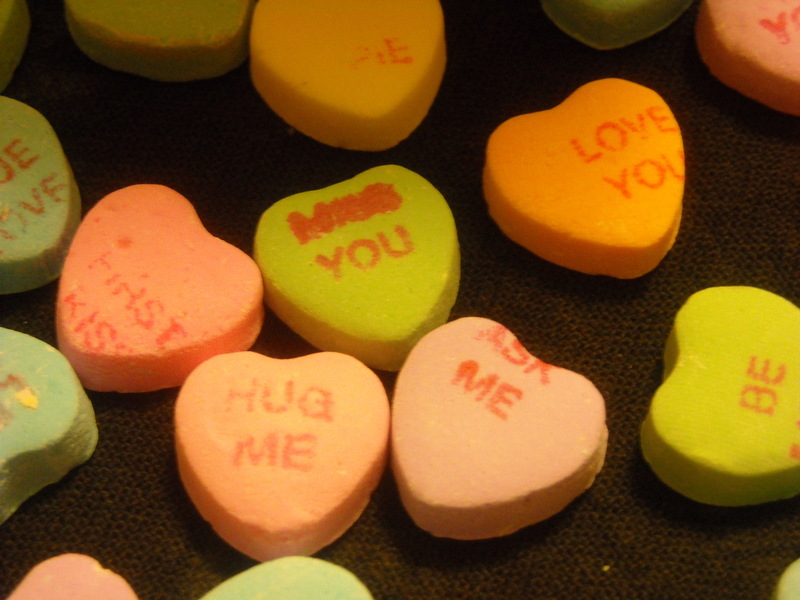 In addition to these, I’ll be dropping off some of my candy sprinkle and candy conversation heart pendants. Well, I’ve got about 20 new rings. Ok, well here are the new rings. The colors are a bit off because of this crummy overcast weather, but it is what it is! I hope you like my new rock-n-roll and crafting themes! Hello and welcome to the first Handmade Monday tutorial! I have had this idea since I started my blog, and finally I am ready to bring you the first installment! 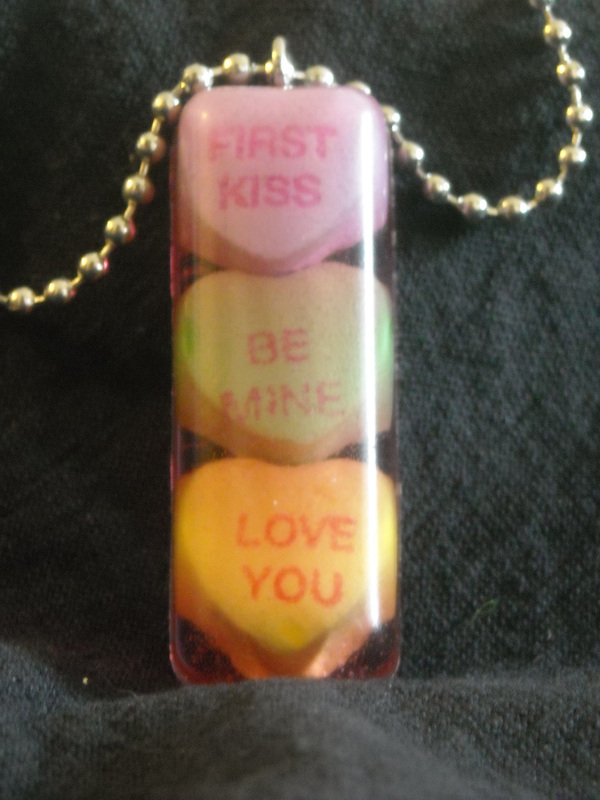 With Valentine’s Day right around the corner, I had an idea to make these really cute resin pendants with Sweetheart Conversation Hearts. 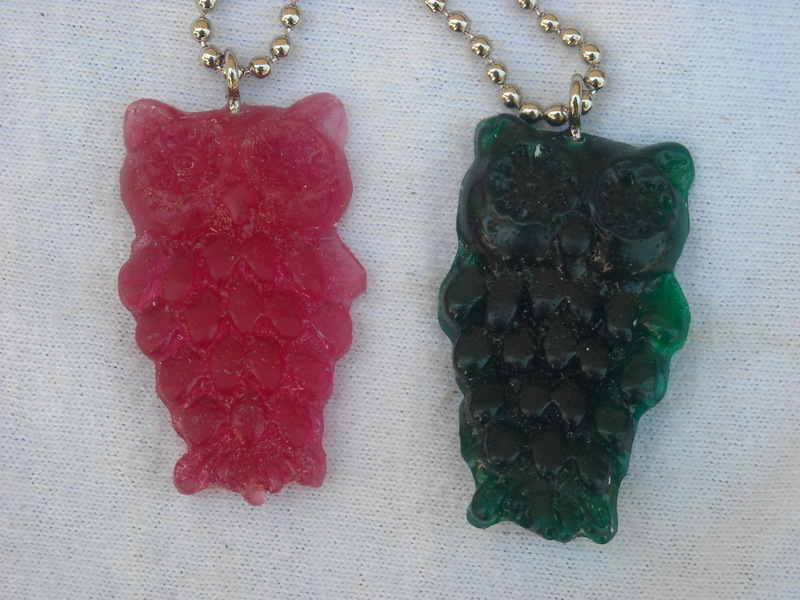 So, let’s dive into how to make these cute resin pendants. First I want to tell you about how to make the resin in the mold, then we will talk about how to turn the resin into a pendant. Step one is to spray the inside of your resin molds with the mold release spray. Trust me that this will make your life so much easier, and it will result in less prying and possible scratching later on if you don’t use it. Make sure the molds are nice and wet and then set aside to dry while you work through the next couple of steps. If they aren’t dry completely when you are ready for them, simply wipe thoroughly with a dry rag. The next step is to mix your resin. 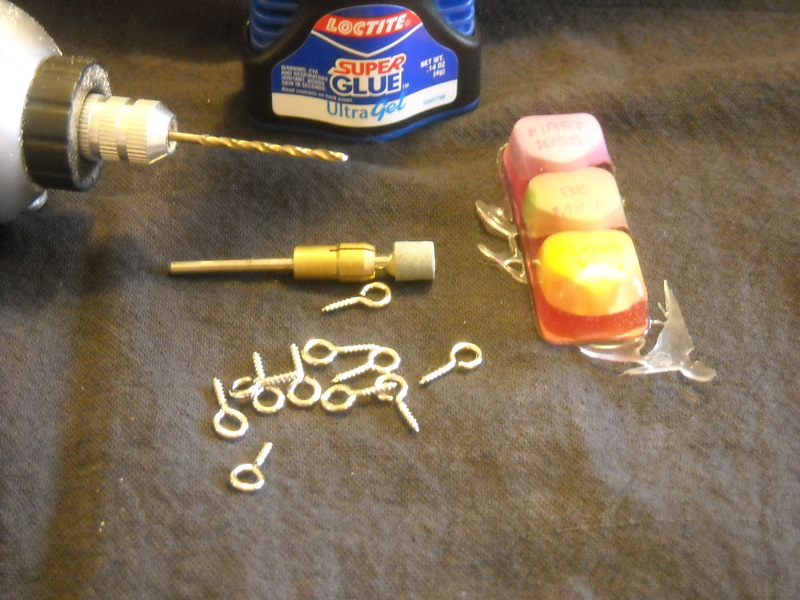 Follow the instructions for the type of resin you have, but I use Castin’ Craft Easy Cast, and it mixes at at one to one ratio. 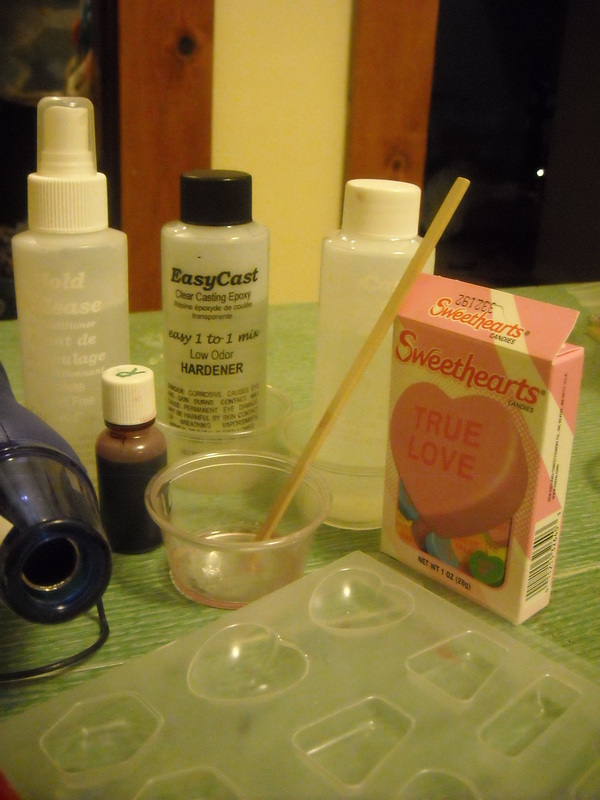 After you mix your resin for the amount of time the instructions indicate, mix in one very small drop of Castin’ Craft Resin Dye. It will be a nice, light pinkish red color. 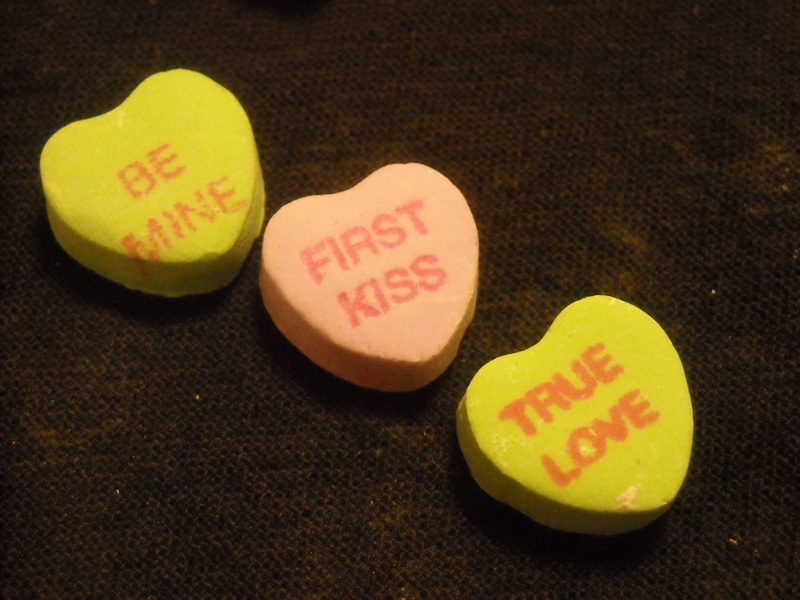 and then press the candies on top of this thin layer and wiggle them around. 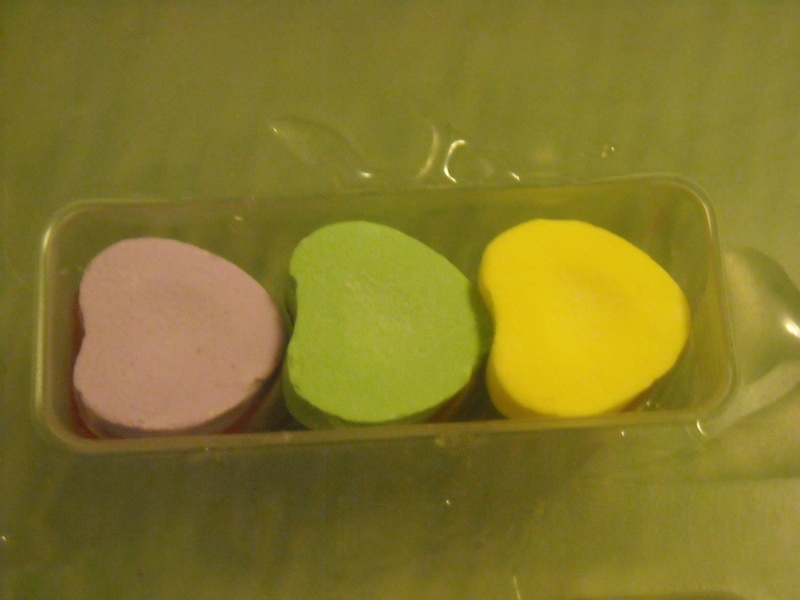 They need to be face down because the face down part will actually be the front when you pop it out of the mold. 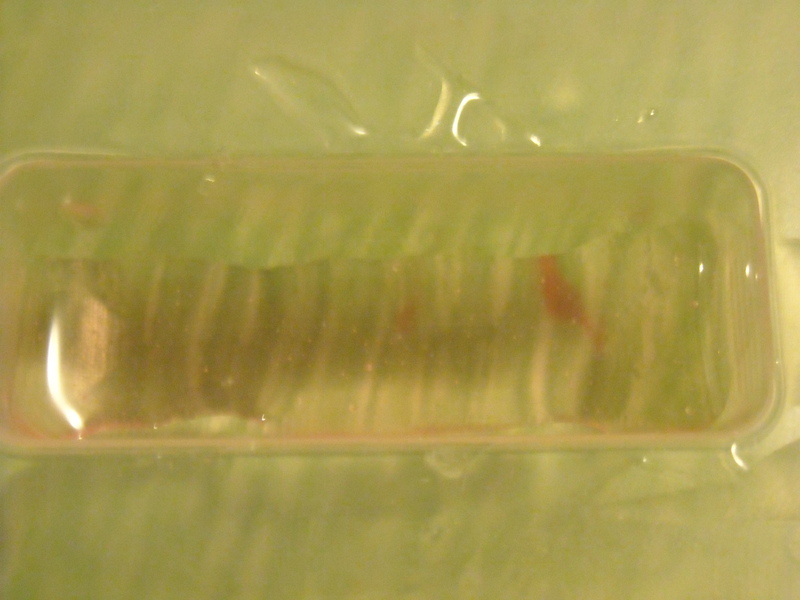 You really want to make sure that no giant air bubbles get caught between the resin mold bottom and the candy, so you may want to carefully lift up the mold and check for air bubbles. 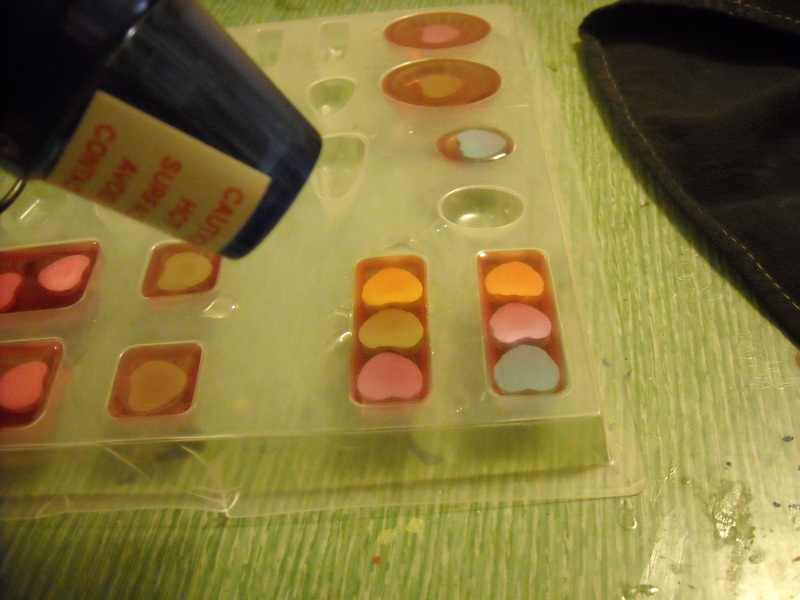 Now you are ready to pour the resin into the mold to cover the candy. 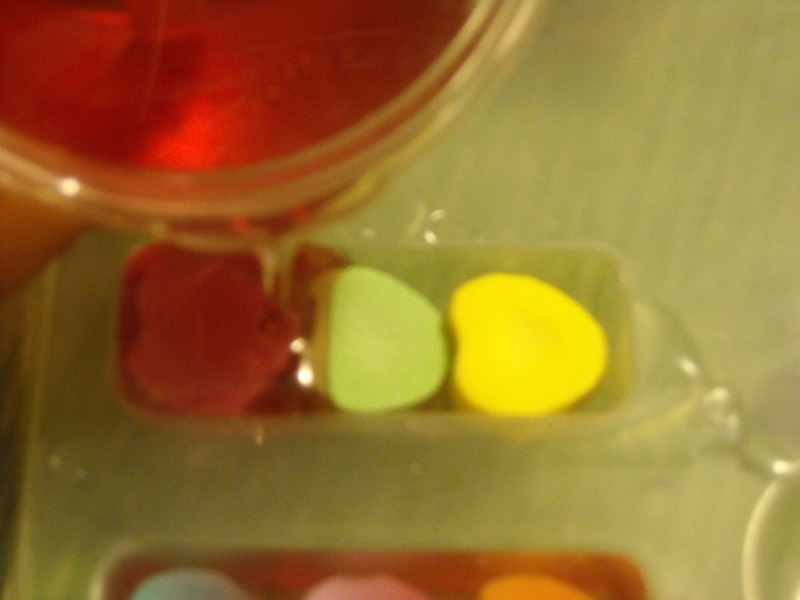 Slowly and carefully pour the resin into the mold to cover the candy and bring the resin up level with the mold edge. After you have filled all the molds you want to fill with candy and resin, use your heat gun and from about 6-10 inches away, sweep the hot air back and forth over the molds so all the bubbles which have formed will pop, leaving you with a nice smooth surface. 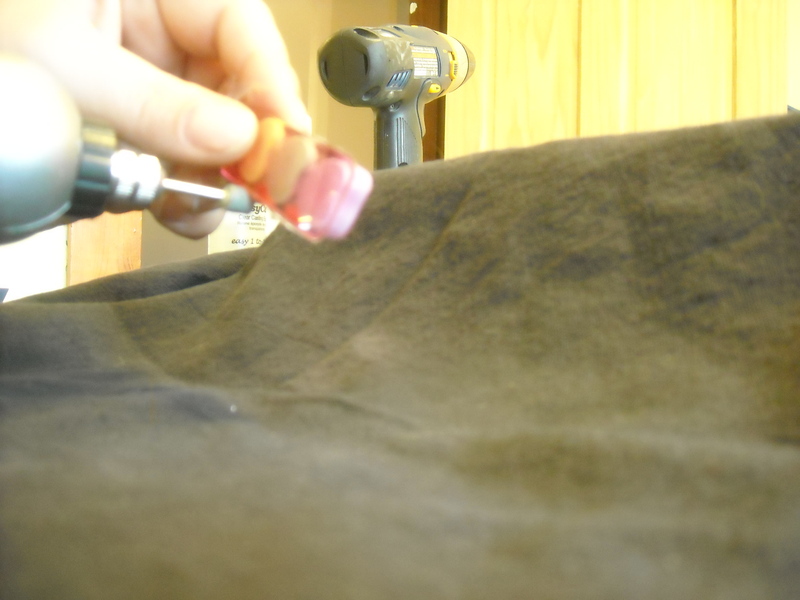 Be careful not to hold the heat gun too close to the wet resin, or it might cause it to blow out of the mold, and that will just result in more work later. Ok, the last thing you are going to do for about 24 hours is set something over the top of the molds so that no fuzz, pet hair, dust, etc., can settle on the mold. 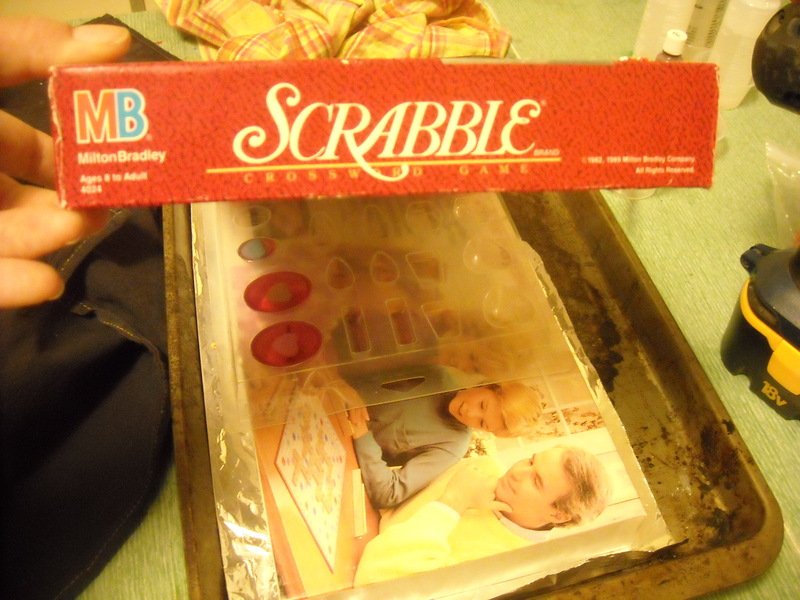 My favorite thing to use is an empty game box. It seems to work just perfect for me. Just be careful to set it on a nice level surface, and then, after waiting about 24 hours you will be ready to move on to the next big step. First, you’ll need the dremel tool with the sanding attachment. Turn it on and carefully go around the edges of the resin pendant and smooth it down so it is all even and very level all the way around the mold. This will make a bit of a mess and cause a lot of resin dust to fly about, so be careful to avoid breathing it in or getting it in your eyes. Once you’ve smoothed the whole thing out, it’s time to put the drill attachment on and drill a very small hole into the top of pendant. The drill be size will be determined by the size of the eyelet you choose. They should be almost identical in size. 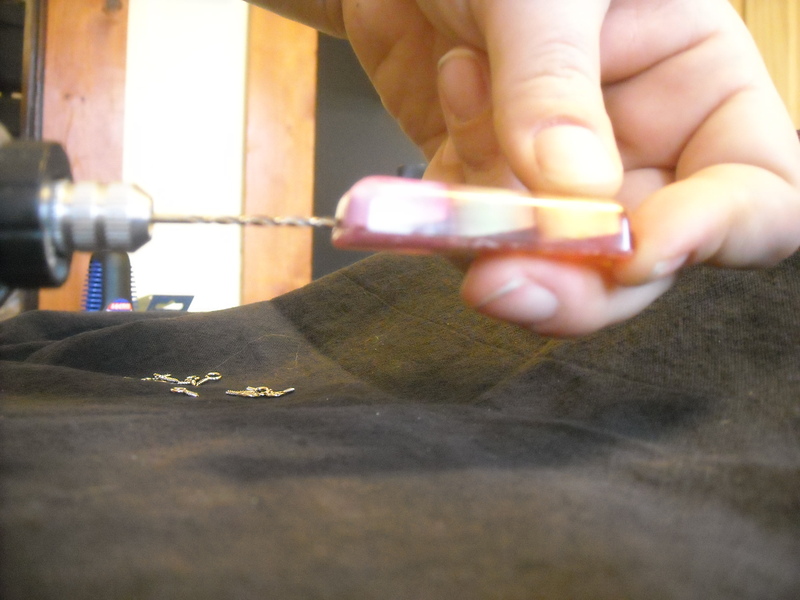 Try to drill the hole either into, or behind the candy pieces so the eyelet will not be visible from the front of the necklace. 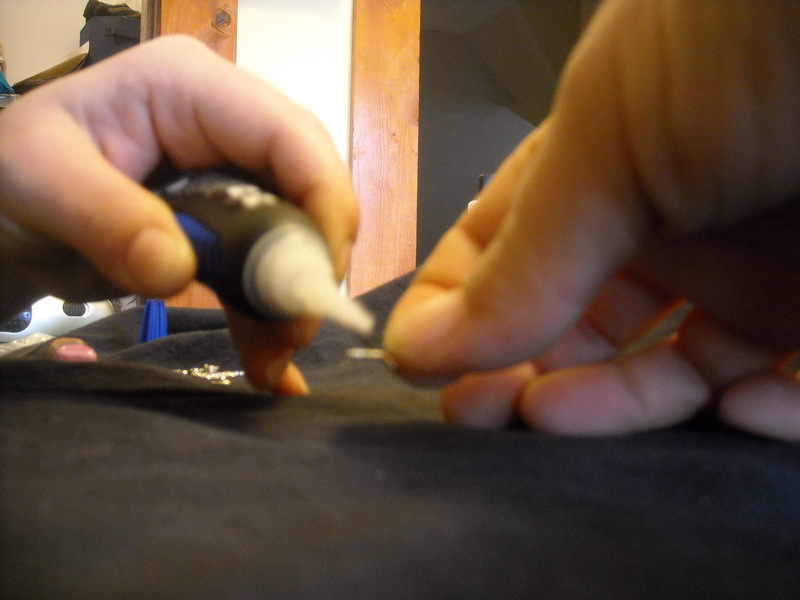 Next, take an eyelet and make sure it fits into the hole (that it is deep enough, mainly). If it fits tightly, you may just be able to screw it in to secure it. If the eyelet is a bit loose, then you should put a small dab of super glue on to the eyelet and then put it into the hole. Make sure the eyelet is turned in the right way to run a chain through and hang correctly on the neck. Let the super glue dry for about 15 minutes, string your necklace onto a chain or a nice pink ribbon, and then your necklace is ready to wear! I hope you liked today’s tutorial. I would love to hear from you if you make one for yourself, and I’d especially love to see what you make! 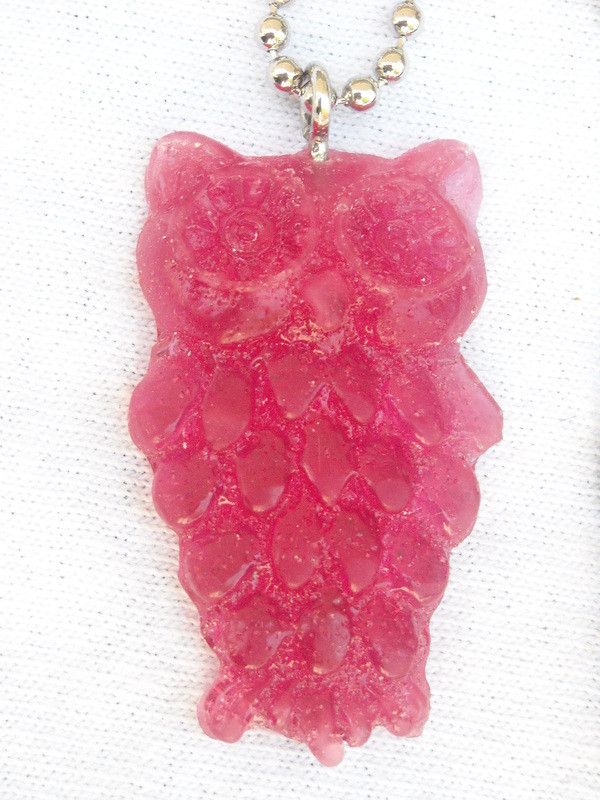 I’d also love to hear anything you have to say about working with resin- why do you or do you not work with resin? What makes resin so overwhelming to some people? What is one of the worst resin pouring mishaps you have made? Leave a comment on the blog and I will select at random a winner one week from today and they will receive the pendant I made in this tutorial!